In an effort to prevent fires in the commercial kitchen, numerous studies have gone out to discover what the leading cause of these unexpected blazes is – the results showed that, more than anything, fires in buildings are caused by accidents in the kitchen. 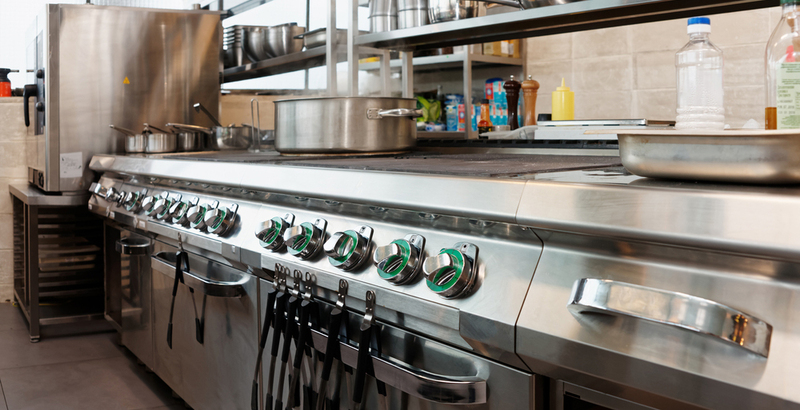 Whether it’s the cook forgetting their cooking, a grease fire, or a fault appliance, it’s clear that the kitchen is a natural fire hazard, and should be treated as such by business owners. It’s clear that fire protection and prevention methods should be considered on a unique basis where the kitchen is concerned. Let’s discuss a few things that can keep you from going out of the frying pan and into the fire! The kitchen is where the majority of all home fires start, and the cause for most kitchen fires is from one source – cooking. Too many of us are called away from cooking by other distractions, or forget that we were cooking something at all. Be a responsible cook – keep a close eye on your cooking! While your food is being prepared, be sure to check up on it every few minutes. Stove top cooking can easily start to burn if not watched carefully, and the burnt food can catch on fire rapidly. Once a fire starts in the pan, it can spread to the rest of the kitchen with ease. Cooking doesn’t even have to burn for a fire to catch on to nearby objects – oven mitts and other nearby items can catch fire if they are in too close of proximity to the heat of the stove top. If you are afraid that you will forget you are in the midst of cooking something, or are prone to forgetfulness, set a timer to remind you to check up on the food. Often times, people will forget they are cooking at all until the timer goes off! A great deal of fires are started when people forget their food in the oven or leave the burner on the stove top turned on for countless hours. Grease fires are a huge danger in the kitchen – they burn out of control in just a few seconds, and the damage can be surprising and catastrophic. Over time, grease can build up on a stove and even inside of an oven – where grease builds up, a grease fire can’t be far behind. Clean your oven and stove top regularly, and be sure to scrub those hard to reach places where grease gets trapped. Did you forget to turn off the oven? Error is a purely human trait, and we all forget very important things from time to time – this is why you should do a check of your kitchen before closing your shift and leaving the kitchen. Check your oven, your stove top, and your appliances. Are they generating heat that they shouldn’t? See anything out of the usual? Most fires occur at night when there is no one in the building, so doing a check of the kitchen before locking the door will assure everyone’s safety.